There are a lot of tributes racing around for President Hinckley, but this little video, i thought, was one of the most neat one's i have seen. Enjoy! 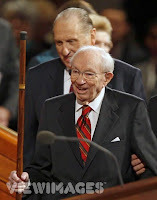 BTW: i am sure Monson will do great, but I've just grown to really love Hinckley... So, it's a little unfamiliar to me to see Monson speaking as our prophet now.